AUDUSD remains in the downtrend from 0.7295, the bounce from 0.7003 is likely consolidation for the downtrend. As long as 0.7206 resistance holds, the downside movement could be expected to resume and one more fall towards 0.6900 is still possible after the consolidation. 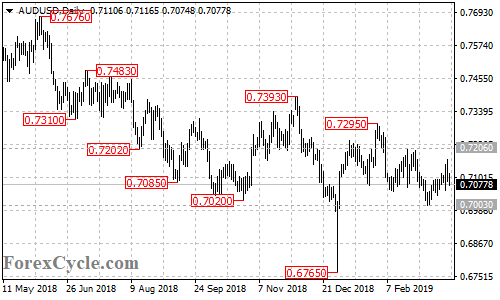 Only a break of 0.7206 resistance would confirm that the downside movement had completed at 0.7003 already, then the pair would find next resistance at around 0.7350.